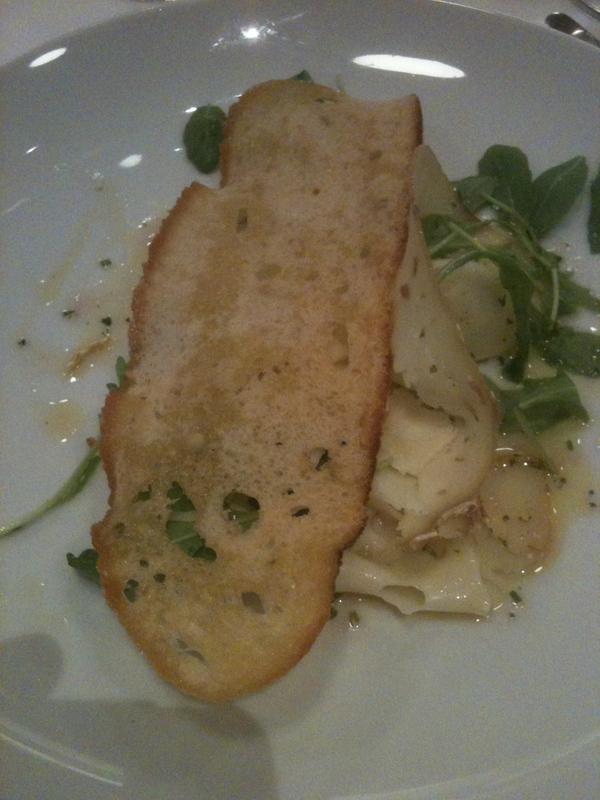 Recently I went to a lunch and tasting of the wine and food of the Valle d’Aosta held at restaurant Manzo in Eataly in NYC. 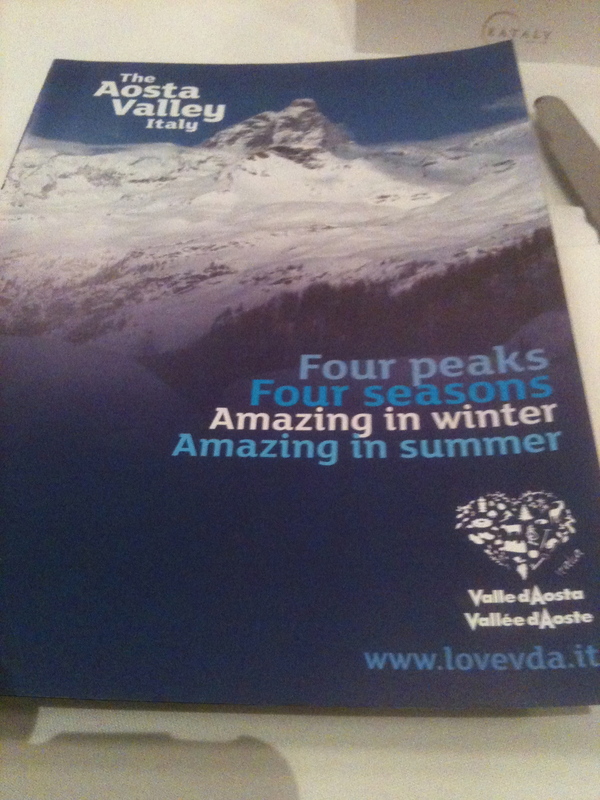 It was more of a promotion for tourism in the Valle d’ Aosta than it was for the wine. In fact no one spoke about the wine. There were four wines at the event and I liked them very much. The wines of this region are made from some interesting grape varieties that are not very well known in this country such as: Prié Blanc, Cornalin, Fumin, Petit Rouge and Moscat Petit Grain. I decided to learn more about these grapes and the wines they make. Learning everything about Italian grape varieties is impossible, but I keep on trying. The Valle d’Aosta is an autonomous region in Northwestern Italy that is surrounded by the Alps. It is the smallest of the winemaking regions of Italy both in terms of size and production. 75% of the production is red. 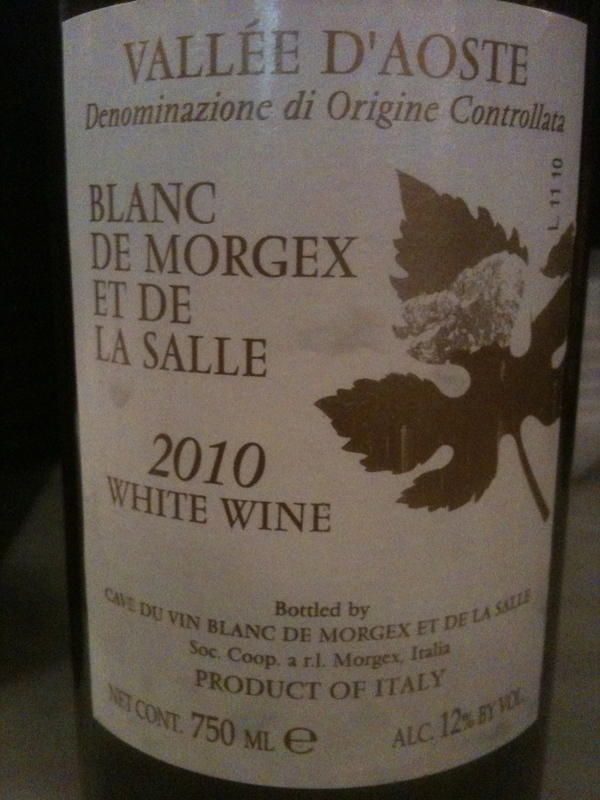 Valle d’Aosta Bianco 2010 DOC 100% Prié Blanc Cave du Blanc, Blanc de Morgex et la Salle This is a cooperative started by the state government of the Valle d’Aosta in 1983. The communes of Morgex and La Salle are located at the foot of Mount Blanc and they have the highest vineyards in all Europe at 4,000 feet above sea level. The average age of the vineyards is about 60 years old. The vineyards are planted with the “pergola bassa” (low pergola) system that trains the vines low to the ground in trellised arbors. Stone columns surrounded by terrace rock walls protect the vines from snow and the strong winds. These stonewalls allow the vines to absorb the heat stored in the rocks during the day light hours. All of this also helps to protect the vines from the shifts in day/night temperatures that occur in mountain areas. Because of the training system during harvest the grape pickers must bend down or lie close to the ground to pick the grapes. Piér Blanc is know in Switzerland’s Valais region as Bernardeand is best suited to the sandy, gravelly soil found in higher attitudes. Most of the vines are on their original rootstock because it is too cold for phylloxera to survive here. 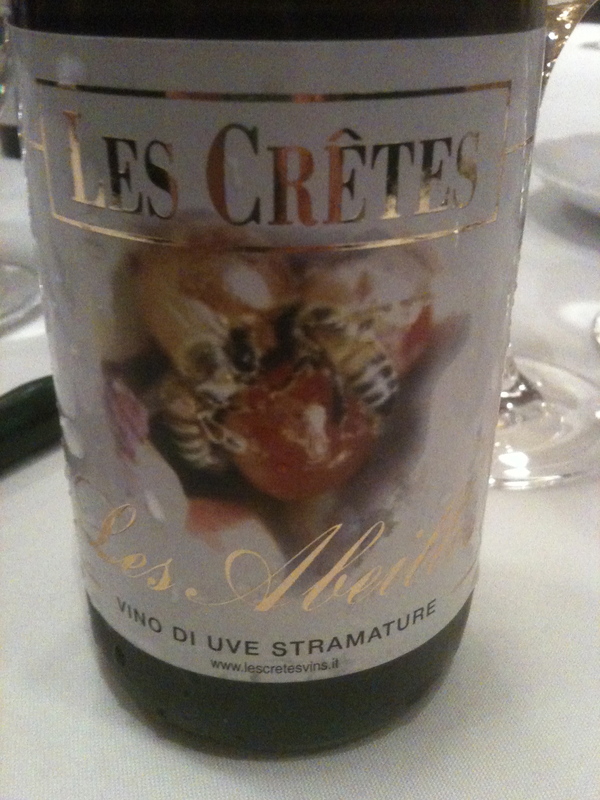 This is a balanced wine with hints of apple, spice and honey with good minerality and acidity. It had a surprising long finish and nice aftertaste. We had this with the formaggino di peranche (cows cheese marinated with olive oil and herbs served on thin slices of toasted bread) and it was a great combination with the wine. 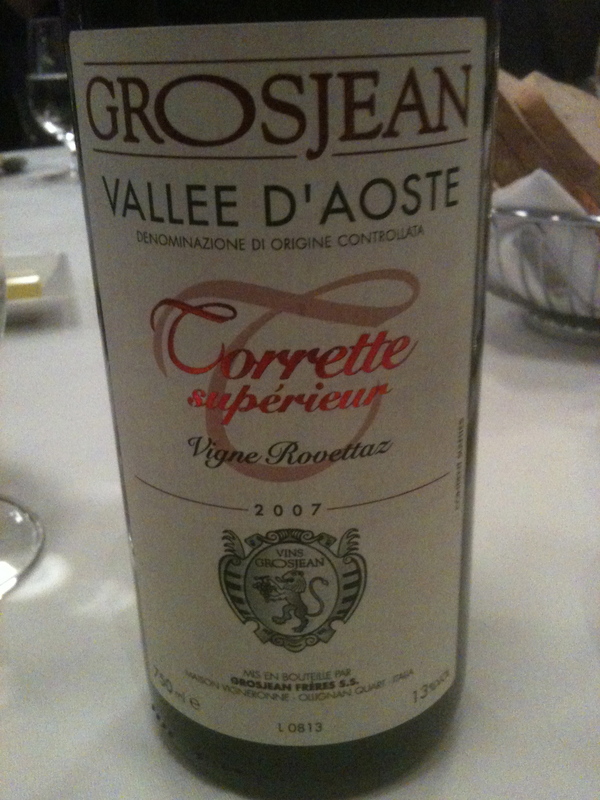 Torrette Superiore “Vigne Rovettaz” 2007 Valle d’Aosta DOC. Grosjean Freres Made from 85% Petit Rouge, 10% Fumin and 5% Cornalin. The vineyards have a south/southwest exposure and the soil it is rich a sandy soil. Sustainable farming techniques have been in place since 1975. Only organic fertilizers are applied and no herbicides or pesticides are used. Natural yeasts are used for fermentation. Maceration takes place on the skins for 6 to 7 days with pumping over three times a day. Aging is done in stainless steel tanks. It is a light red wine with very nice berry aromas and flavors with hints of raspberries. 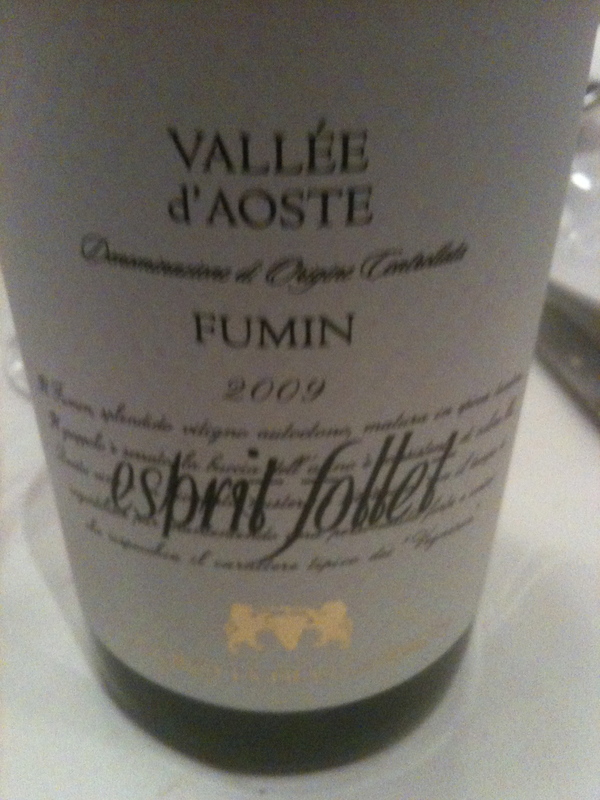 Fumin “Espirit Follet” 2009 DOC Vale d’Aosta La Crotta di Vegneron Made from 100% Fumin (a distant cousin to Syrah) This is a small co-op located in the village of Chambave. The vineyards are south facing, steep and seem to be pasted to the sides of the mountain. They are 400 to 1,500 meters above sea level. The soil is composed mainly of rocks that give a nice minerality to the wine. The grapes are hand harvested and the wine is fermented with natural yeast as are all of their red wines. This was a big red wine with dark fruit aromas and flavor , peppery notes with good minerality and acidity.